Set in the hillside, The Barcelo Jandia Resort is 800m from the sandy beach which can be accessed by tunnel. The main resort centre is only a 10-15 minute walk if you decide to venture out and check out the local nightlife, restaurants or shops. 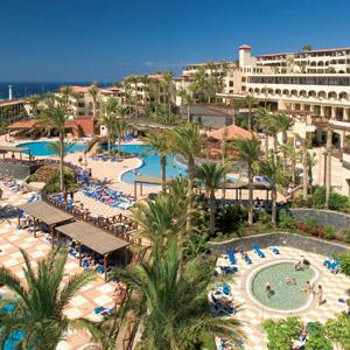 The hotel resort as a whole offers a huge list of facilities and features including a choice of 5 pools, 4 restaurants, 4 bars, mini golf and evening entertainment. All hot food in the "canteen" was cold due to management austerity cuts - overloaded and understaffed hotel - now putting customers and staff workers , not management, health & safety at risk. Despite other reports in October on Trip Advisor from previous victims we can confirm that the Barcelo Management have not resolved this..
We have had the unpleasant experience of meeting and discussing our concerns at the start of our holiday with young inexperienced managers -Customer Experience Manager Z Berta and an aggressive, impolite, intimidating, ungentlemanly Assistant Manager, tall dark hair, the Hotel customer enforcer, Guillermo M? (he refused to disclose his surname) whose anti customer attitude has been flagged in another report here. On the 1st November without notifying customers the enforcer applied a dress code in the canteen which only applied to male adults and not female adults and children, which clearly is sexual discrimination and inevitably caused distress and confusion, particularly for young children. He also enforced a chaotic queue system of entering the canteen even when there were unoccupied tables. Sadly Edwardo, the Hotel Manager and a Barcelo Director we were informed, would not rearrange a meeting we had requested with him. ZB informed us that there had been a change in Barcelo Management after our last stay in the Hotel in Feb 2016. She did not take our concerns seriously, laughed and smiled about them and did nothing. If you want to know the truth we suggest that you only identify and consider bona fide reviews after this date. We have stayed regularly at this top quality well designed and built hotel complex in the last ten years and had some excellent holidays. ZB referred to us negatively as "habitual clients" and we realised why when we brought to her attention the management cuts made since our last and previous stays. Of course new clients will be oblivious to these. Most of the long serving staff we had become familiar with over the years were no longer there having been replaced by a substantially smaller number of clearly untrained, unsupervised staff no doubt on short term contracts, who could not cope with meeting the previous managements acceptable higher standards. One chef in the kitchen did not know how to properly cook an egg! We saw the Kitchen Manager once in the canteen which previously was a run and set out as a restaurant. The room we pre requested and normally stay in without any supplements was not allocated as we were not prepared to pay the 8 euro per night per person for the sea view when the balcony is perpendicular to the sea overlooking the pool and does not have a direct sea facing view. We arrived to be greeted by building works - a smaller tacky reception desk had been created at the former indoor bar area and there bar was in the process of being formed the result being no indoor bar lounge area for the majority of the week. The new bar staff were unfriendly and did not know how to prepare the cocktail drinks on the menu many of which now are no longer included as AI. The childrens paddling pool with sunbeds around for parents has been replaced by an expensive splash park facility with no sunbeds. The result was that hardly any kids used the facility and as a result the children used the shallow parts of two main pools where parents could relax and watch on sunbeds. Half way through the week the splash park area was no longer operating. The evening entertainment standard had also plummeted, caused again by managenment cuts. We only attended one show the Horror Halloween evening and like most of the audience walked out after 15 minutes as it was so poor. This Hotel is not safe if you intend to eat and drink at the hotel. You have been warned. Notably unusually there were hardly any German guests when in the past they have been in a majority - another indicator of truth as Germans do not tolerate inadequate standards. Our last stay at the Jandia Mar and a Barcelo Hotel. Anyone recommend anywhere else in Fuerte? Many thanks to the previous Barcelo Management and former staff for the wonderful holidays and memories we have of this hotel. Hotel tip: Establish what is included in the all inclusive package and what the "extras" are before you book. Lovely hotel, loads of sunbeds. Staff all very helpful! Get a taxi back from the beach though, the walk back up the steep hill is killer in the heat! Very clean hotel. The food was nice and there is a great lot of choice for everyone, especially dinners - lovely. Close to a wonderful quiet beach. For whole stay (7 days) we rented a car, which was the cheapest option of transport to get to Hotel. We went to see the coffete beach wonderful view from the peak of the hill and laguna 10 min away from Jandia which is worth to see it.